DE – Raga CDs of the Months (06/2016): 726 Years of Celestial Music. For all music lovers of Indian Classics around the globe the year 2011 was a tough one with heavily mourning for the greatest music maestros. 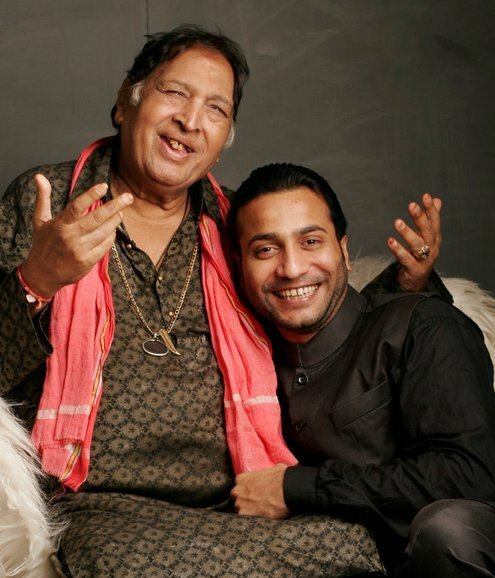 We have lost them as beloved composers or film makers, as vocalists (Rabindra Sangeet, Khayal, Dhrupad and Ghazal), instrumentalists (on Sarangi, Flute and Sitar) or as percussionists (e.g. Tabla). The Indian classical music is performed for many centuries as the in Western style well known chamber ensemble. The term „Jugalbandi “(or jugalbhandi) literary means „twins tied together“. The introduction of the Jugalbandi cannot be dated exactly. 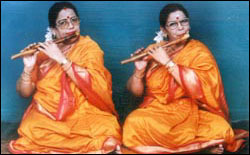 A Jugalbandi is at least of two soloists (vocalist or instrumentalist), who play hand-in-hand. One cannot differentiate between an accompanying instrument and a single solo player. It is like the meeting of two strangers, who step synergeticly together into a dialogue. They can be accompanied by two percussionists, e.g. 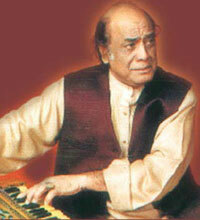 on the Tabla and Pakhawaj. This constellation is named as „double Jugalbandi“. 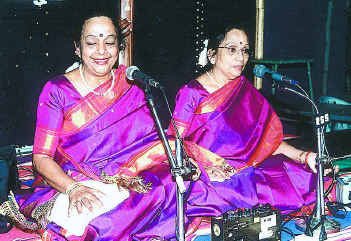 While the Khayal, a modern and elegant vocal style of North Indian Classics (Hindustani) mainly exist as solo form (Ekala) usually reserved for solo singers, the vocal duet was already known in the in oldest style of Hindustani, the Dhrupad (Rec. 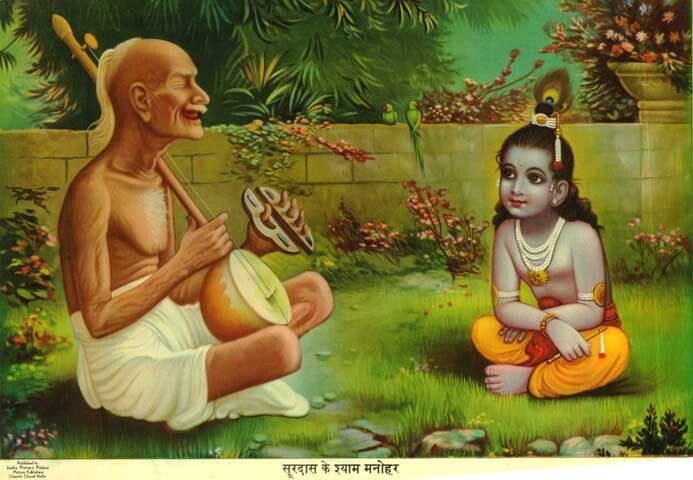 : The birth of the Dhrupad can approximately be dated back to 100 AC .) In the Dhrupad (vocal style) same as in other categories of music work the term appears as “yugul “. It means „pair “. Note: IMC OnAir’s radio show „Jugalbandi” defines the duet in Indian Classics contentwise to the identically compositorial term. The Indian musicologist Vishnu Narayan Bhatkhande created Jugalbandi compositions. Bhatkhande lived till 1936 (10 Aug 1860 – 19 Sept 1936); he is the inventor of the classification scheme of North Indian ragas, the so called Thaat system. For his Jugalbandi compositions Bhatkhande picked up a traditional raga form and confronted to it with a modern modification. By this contrast the traditional Raga melodic was clearly audible for the public (editorial note: melodic is a „content describing“ contrary to the melody as „form describing “). 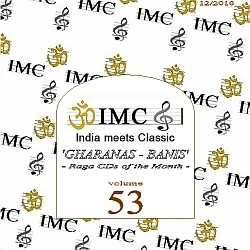 A – Raga CDs of the Months (05/2016): Studies in Indian Classical Music (part 1). The promotion initiative IMC – India meets Classic will present the topic “Studies of Indian classical music” (part 1 and following). Beside original music from India this radio show will answer the substantial question for all those who are interested to study Indian music: “How to choose a teacher (Guru)?”. – The pro and cons of different methods of teaching will be lit up in this series considering the characteristics of instrumental play and Indian vocal styles. At the latest since the musical discovery journeys of Menuhin and Coltrane the broader interest in studying Indian Classical music grew in the West. It is unbroken until today. The violin virtuoso Sir Yehudi Menuhin visited India in 1952 for the first time. 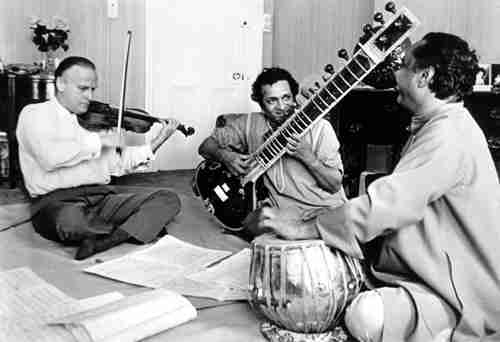 Later Menuhin took lessons from the legendary sitar player Ravi Shankar. The modal concept of Indian Ragas is reflected also in the music of the jazz saxophonists John Coltrane. Coltrane’s composition “India” (from the jazz album “Live at the Village Vanguard”) originates from the year 1961, in which he met Ravi Shankar. Coltrane studied Indian religion and philosophy apart from Indian classics. For the approach to the musical training the new radio show orientates with two western terms. As there would be: music schools and music sciences. In that more than 2000 years old system of Indian classical music of North and South India we find the similar term Gharana. The Gharana-s are less a kind of music schools in the Western sense. Gharana is a name for the heritage of a musical tradition which is overhanded mostly in oral form over many generations from teacher (guru) to pupil (shishya). Gharana is derived from the Hindu word “Ghar“, i.e. family or house. There exist Gharana-s for singing, instrumental play, the Indian percussion instrument Tabla, for Indian dance and some wind and string instruments. In view of more than 30 existing Gharana-s we are limiting part 1 of our topic “Studies of Indian classical music” to the oldest singing form of the North Indian classical music: the Dhrupad. 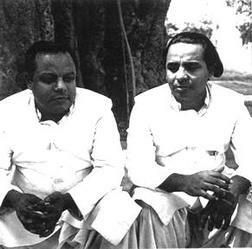 Grandsons of Zakiruddin Khan and Allabande Khan – The Dagar Brothers ( from left to right): Ustad Zia Fariduddin Dagar( b1933), Ustad Nasir Zahiruddin Dagar(1932-1994), Ustad Rahim Fahimuddin Dagar(b 1927), Ustad Nasir Aminuddin Dagar(1923-2000), Ustad Zia Mohiuddin Dagar (1929-1990), Ustad Nasir Faiyazuddin Dagar(1934-1989), Ustad Hussain Sayeeduddin Dagar(b1939). The oldest music school for Dhrupad is the Dagar Gharana. 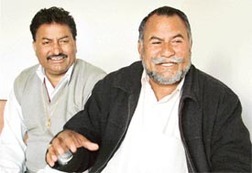 It’s name refers directly to the Dagar Family (see below) which determines the development of the Dhrupad style until today, unbroken since more than 20 generations. The term Gharana is not even as old as the family traditions. 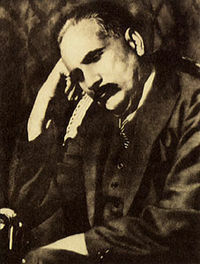 The social meaning of the Gharana-s became of relevance for the stylistic idendity of an artist in instrumental play or vocal lately in the midth of 19th century. 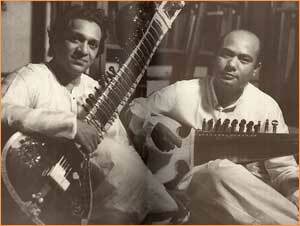 The Gharana-s of the Dhrupad style have a pre-history. 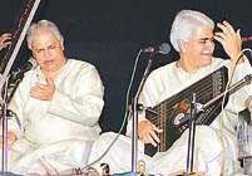 All Gharana-s are attributed only to four lineages, the so called Bani-s (or Vani-s). Bani means “word“, it is derived from the Sanskrit “Vani“, i.e. “voice“. The Banis are style concepts. The four Dhrupad Bani-s had been constituted by four outstanding musicians at the court of the mughal emperor Akbar (1542-1605). There are: Gaudhari Vani or named as Gohar or Gauri Vani in the tradition of the famous court musician Tansen, Khandari Vani of Samokhana Simbha (Naubad Khan), Nauhari Vani in the tradition of Shrichanda and Dangari or Dagar Vani of Vrija Chanda. 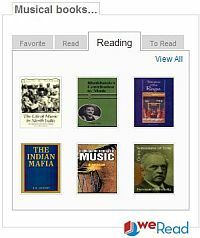 If one looks further back in the music history of India one discovers in the 7th century a link to the Bani-s. The four Bani-s of the Dhrupad had developed from seven in the core five (5) singing styles, the Geeti-s. These Geeti-s are: Suddha, Bhinna, Gauri, Vegswara and Sadharani. Gaudi Geeti is not far more in use. 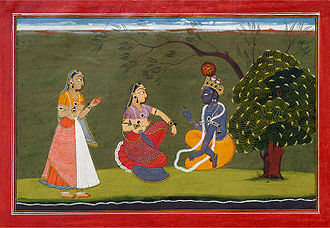 The Dagar family’s contribution to the perpetuation and enrichment of this art, while pre­serving its original purity, has been so precious, and the fact that the history of this family can be traced back for 20 generations without a break is so unique, that the family can be said to represent a microcosm of the history of Indian classical music. 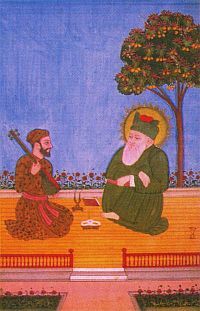 Dhrupad reached its apogee in the 16th century, during the reign of the Moghul emperor Akbar. At that time there were four Schools of Dhrupad, representing this art in all its diversity. Brij Chand Rajput was of Dagar lineage, so the school of Dhrupad that he headed was called Dagar Vani. The other three Vanis, Khandar, Nauvahar and Gobarhar. respectively, almost disappeared in the course of time, and only in the Dagar Vani has the pure tradition of Dhrupad been maintained and brought down to our day. 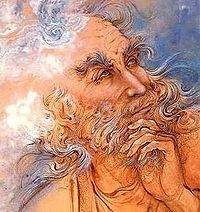 Until the 16th century the Dagars were Brahmins, but circumstances constrained their ancestor, Baba Gopal Das Pandey, to embrace Islam, and he came to be known as Baba Imam Khan Dagar . 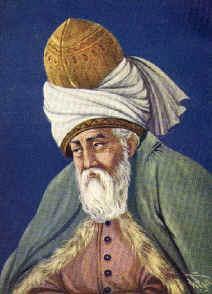 One of his two sons, Ustad Behram Khan Dagar, was the most famous and learned musician of his time, in the 18th and 19th centuries. 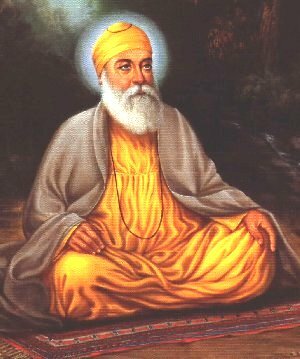 During the 125 years of life that God granted him, he applied himself to the acquisition of a thorough knowledge of the Sanskrit sacred texts. He devoted the greater part of his life to the rigorous analysis of these texts in order to translate the formal musical rules into a pragmatic teaching method. He distilled the style of singing, the gayaki, to a degree of purity and clarity never known before, elaborating the alap and rendering singable the technical forms. 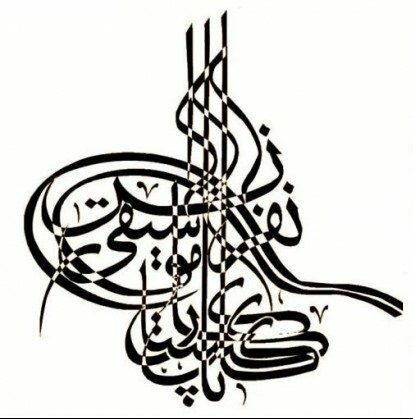 CH– Raga CDs of the months (05/2016): Tradition & Modernity – A Tribute to Ali Akbar Khan. 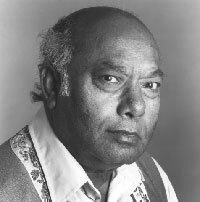 „A Tribute to Ali Akbar Khan“- IM OnAir’s radio show in May 2016 honours one of the Legends on the Sarod, the Johann Sebastian Bach of North Indian Classics or simply Khansahib as Ali Akbar Khan was called in India affectionately. A – Raga CDs of the Months (05/2016): KALPITA SANGITA – Compositions in Indian Classics. The 5 tone raga Malkauns for example reflects a portrait of the dark, secret one and is helping to a menthal stabilization. The Raga Durga carries the names of the ambivalent, semi terrible hindustic goddess Durga. The penthatonic raga Bhupali is awarded a healing, positive effect, which shifts the listener into an easy, joyfully and relaxed tension.